I thank the Ministère de l’Enseignement Supérieur et de la Recherche Scientifique, in particular the Direction Nationale de la Recherche Scientifique et Technologique (DNRST) and the Institut de Recherche Environnementale de Bossou (IREB), for granting us over the years the permission to carry out research at Bossou. 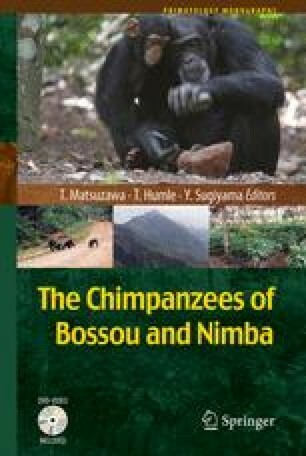 I am particularly grateful to Yukimaru Sugiyama and Tetsuro Matsuzawa, the founders of the research on chimpanzees at Bossou and Nimba, for their continual support and advice, and all colleagues and students from the Bossou research team for increasing over the years our understanding of tool use among the Bossou chimpanzees. Finally, I am forever grateful to the local villagers and all our local assistants at Bossou for all their hard work and their invaluable contributions and collaboration.